FICO, a financial services provider, wanted to address small-to-medium business (SMB) and midmarket customer requests for solutions without on-premise installation. 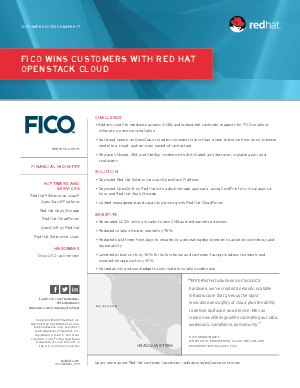 To transition from an on-premise model to a cloud- and services-based infrastructure, FICO chose to build an OpenStack® cloud using Red Hat® solutions, including OpenShift by Red Hat and Red Hat Enterprise Linux® OpenStack Platform. As a result, FICO generated US $10 million in sales to new customers, reduced solution time to market by 50%, and lowered storage and overall infrastructure costs.